I am a longtime fan of Bobby Flay, so when the opportunity to review Brunch at Bobby’s arose, I was thrilled to take part! The first thing you’ll notice is the quality of this book and it’s size. Brunch At Bobby’s is beautifully bound with over 140 recipes and 250 full-color pages. The book is divided eight chapters, and while not all are easily translated into the vegan diet, many are already vegetarian. At the back of the book, Bobby even lays out a few menus to help take the guesswork out of planning, however…if you are like me, you’ll just pick and choose your favorites. I sat with a book of little Post-It notes and marked all of the recipes I wanted to try. There ended up being A LOT. I always like to make a recipe from each cookbook I review and this one is no exception. I chose to make a vegan adaptation of Bobby’s Carrot Cake Pancakes (which you will find here). They were absolutely delicious! I really love the layout of this book and if you can get creative enough, you’ll be able to veganize nearly any recipe in it. Some of my personal favorites I plan to veganize include: Frothy Hot White Chocolate (with almond milk, vegan white chocolate and coconut whipped cream perhaps? ), Crumpets (or any of the biscuits in this book), Browned Butter Banana Bread (agave instead of honey and applesauce instead of an egg), Shoofly Muffins (just sub out the margarine for a non-dairy variety), Yogurt Creme Brulee (using coconut yogurt instead) and Cast Iron Home Fries with Creamy Garlic Dressing (using vegan mayo). Yum! 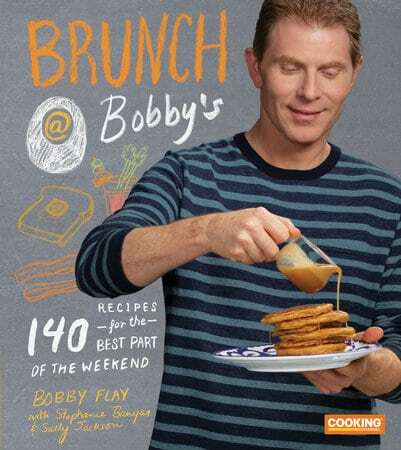 For more information on this book, please visit the publishers page or to learn more about Bobby Flay, visit his profile page here. I really think you’ll love this one and if you already own this book, which is your favorite recipe? Let me know in the comment section below. DISCLOSURE: I received this book from ‘Blogging for Books’ for my honest review.